So how do the drops work, exactly? Pure Pigment drops are revolutionary additives that can be added to your regular hair color service to enhance depth, shine, and dimension, creating a beautiful multi-toned effect that can’t be found anywhere else. Fortunately, Pure Pigments can be used in a variety of ways, depending on your personal preference and desired results. To start, Pure Pigments can be added drop by drop to toners and blonde shades to create subtle cool tones and gentle pastels. To boost color intensity, the same tones can be layered on the hair to achieve vivid hues and brilliance. Additionally, multiple tones can be layered to create a iridescent, almost holographic effect as the hair appears to change color under different lighting. The possibilities are endless! We know that with autumn quickly approaching, it can feel like your bright summer locks are simply fading too fast. But colder temperatures doesn’t have to mean dark, dull hair that falls flat in comparison! 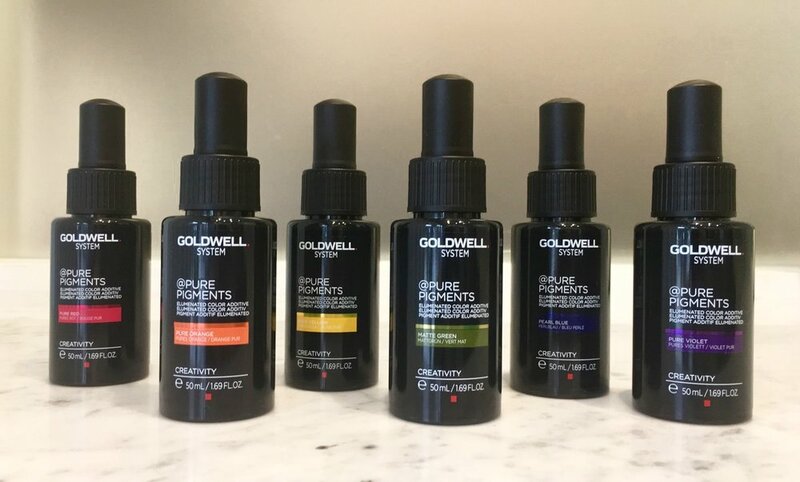 Here at Citrine, we are thrilled to introduce Goldwell’s NEW Elumenated Pure Pigment Drops, the latest in HD hair coloring technology which allows your hair to regain its brilliance and vitality. Pure pigment drops are the perfect way to add back depth, dimension and shine to shades that may be losing their luster. Sound too good to be true? Recent studies found that the use of Pure Pigments results in 63% more shine than regular hair color, boosts shades by up to 3x the color intensity and fortifies color so it is 2x more resistant to fading. With just a few drops, your everyday color is instantly elevated, leaving your hair looking vibrant and feeling fresh throughout the fall season. Stylist Spotlight: Curls for days!